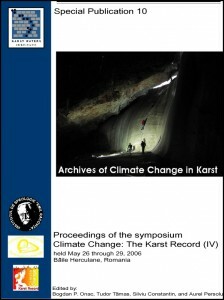 Proceedings of the Symposium: Climate Change the Karst Record, IV. Edited by B. Onac, T. Tamas, S. Constantin, and A. Persoiu. Recommended Citation: B. Onac, T. Tamas, S. Constantin, and A. Persolu (eds), 2006, Proceedings of the Symposium: Climate Change the Karst Record, IV, Special Publication 10, Karst Waters Institute, Leesburg, Virginia, 249 p.